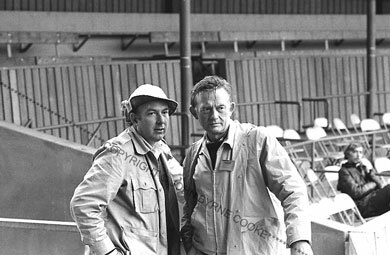 Ricky Leacock (right) and cameraman Roger Murphy evaluate a camera angle at the Monterey County Fairgrounds arena, where the Pop Festival's concerts were held. Ricky and Roger were among the seven cameramen who filmed "Monterey Pop!" with D.A. Pennebaker.